Take it to the edge training set – includes s reversible “studs” textured stroker masturbator, 1 x 29ml Water Glide Lube, So Hard Delay Cream, So Big Plumping Cream, So Dry Anti-Chafing Lotion, Edging Instructions. SKU: 0699-03-BX Barcode: 782421054526 Category: Strokers Tags: His, Kits, Lubricants Brands: Doc Johnson, OptiMALE. The practice of edging has been a trending topic as men everywhere apply this technique to increase their sexual stamina and have more powerful orgasms. 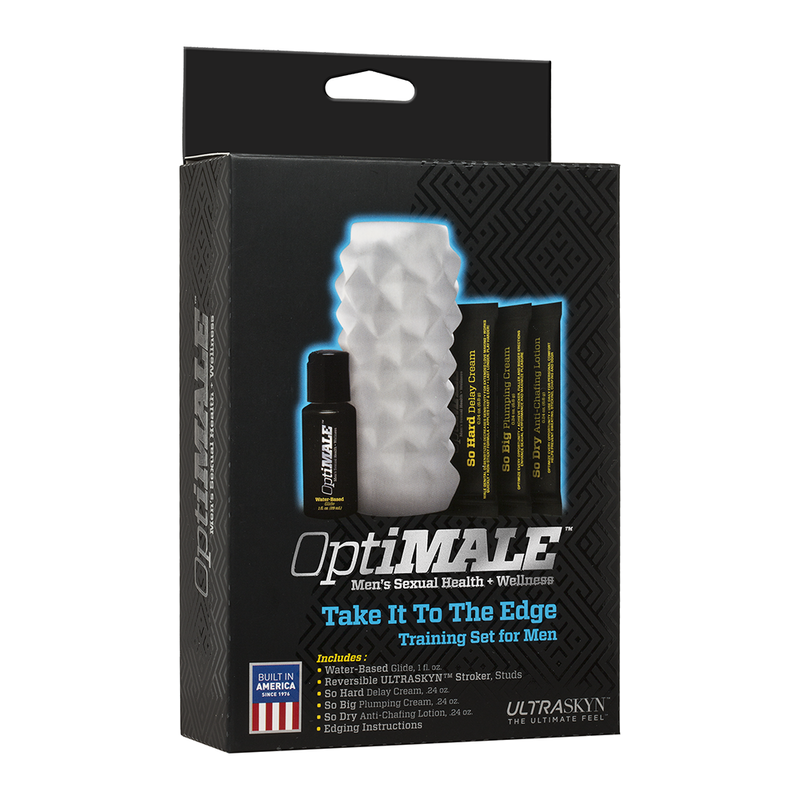 Get in on the action with OptiMALE’s Take It to the Edge Training Set for Men, a complete kit featuring everything you need to start experiencing the sexual health benefits of edging today! With a squirt of the included OptiMALE Water-Based Glide, the lifelike material and pleasure-studded texture of the ULTRASKYN™ stroker feel so real that you’ll be well-equipped when it’s time to show off your new skills with a partner. For optimal comfort and satisfaction, this kit includes three more edging essentials: So Dry Anti-Chafing Lotion to keep you soothed and sweat-free, So Big Plumping Cream that works quickly to give you a thicker and fuller erection, and So Hard Delay Cream to extend your play while you train.